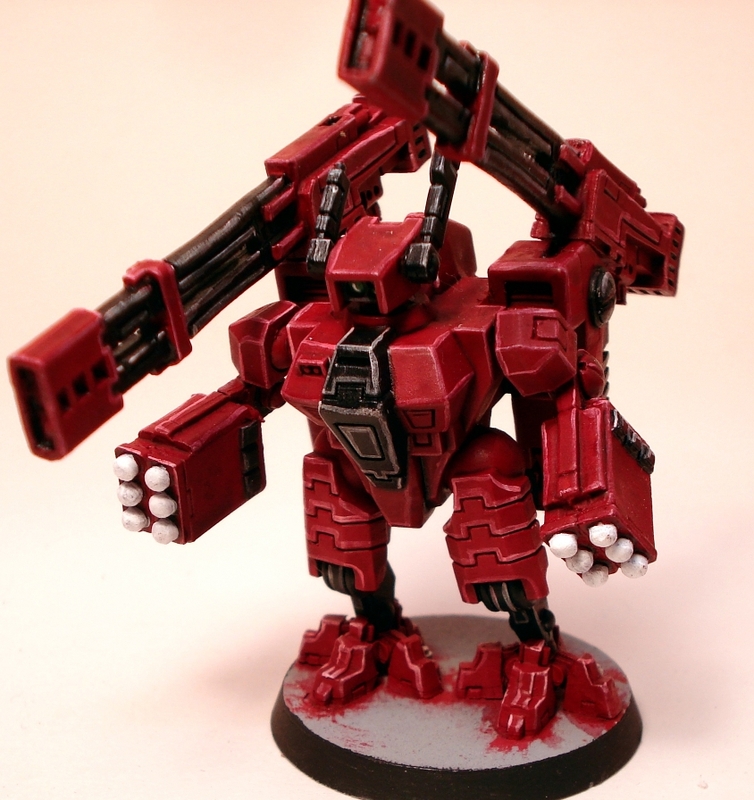 A gun drone and two shield drones from my Tau army. 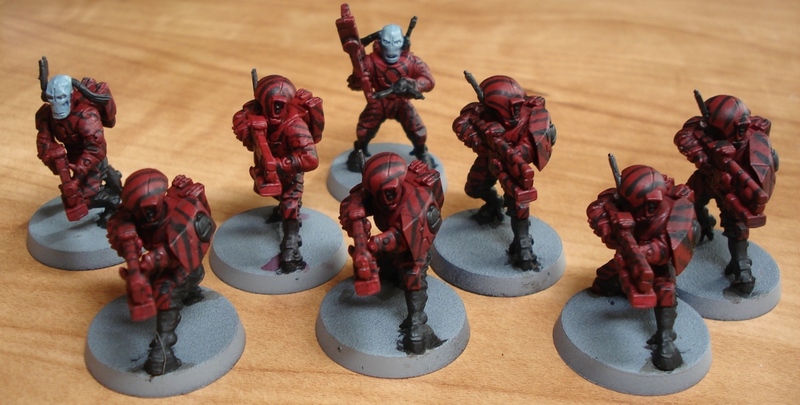 Here are my Tau Pathfinders. They are simply Fire Warriors with the Pulse Carbine instead of the Pulse Rifle. Then I painted them with a tiger stripe style camo to represent their ability to blend in and provide the long range spotting support. 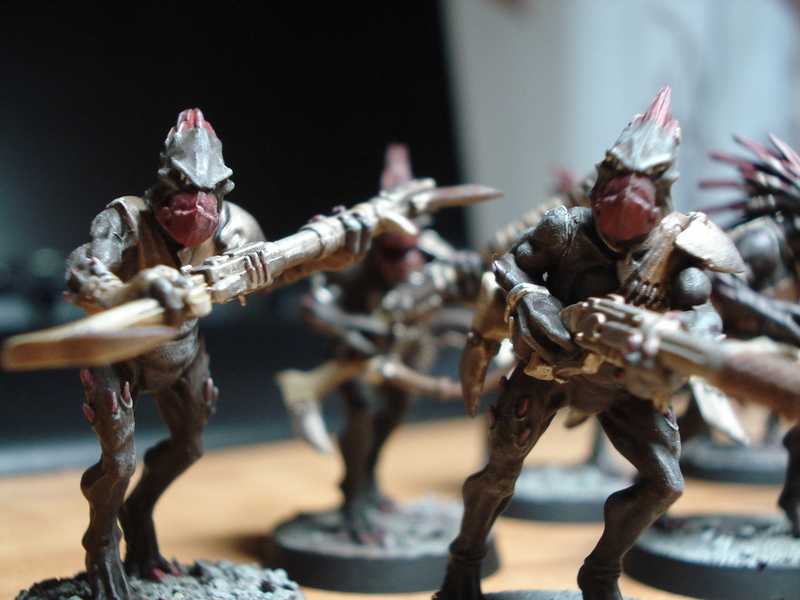 They have not been highlighted, and some details still need to be picked out, but they are ready to hit the tabletop. 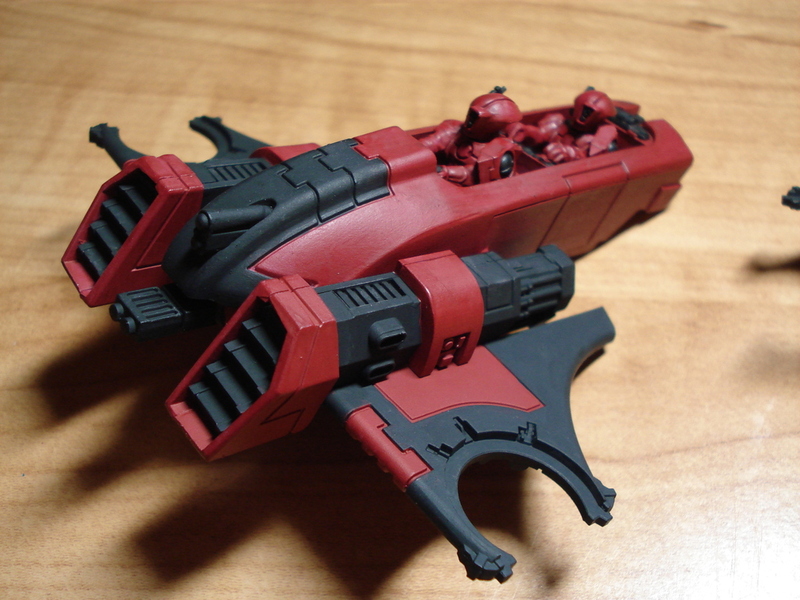 I also did something a little different that what I am accustomed to by painting up a couple without helmets. I usually stick to helmeted guys, since I just think it makes more sense and looks better, but for these I decided to paint up two “squad leaders” without helmets. 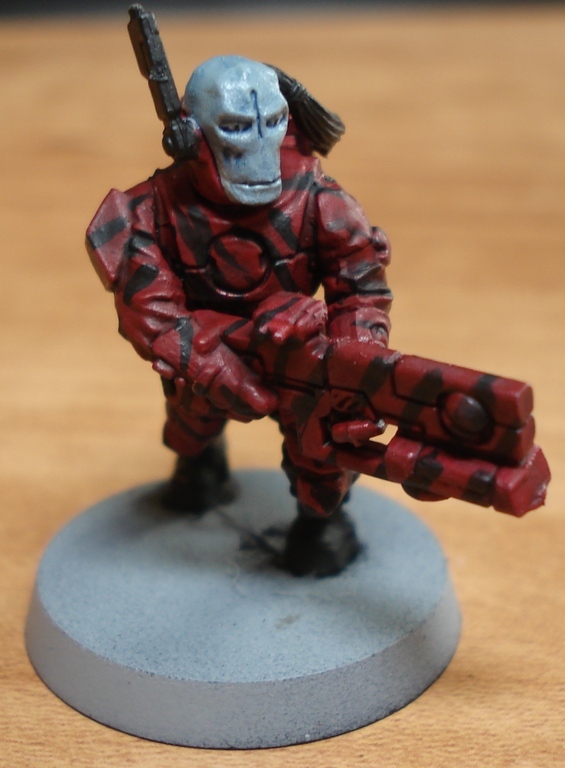 I achieved the grey/blue skin by starting with a base of Astronomican Grey and covering it with a light wash of Asurmen Blue. 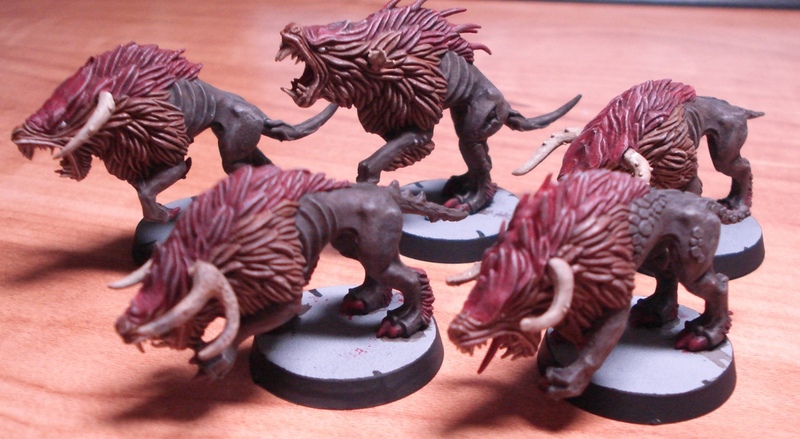 Here are the finished Hounds. A nearly complete Kroot Hound from my Tau army. 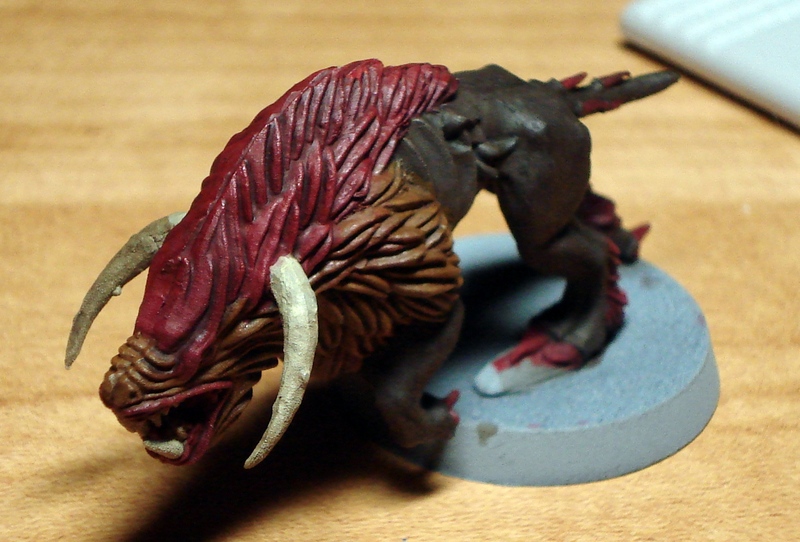 It’s made from a Chaos Hound. I was originally planning on making the entire mane red, but that was a bit too much. 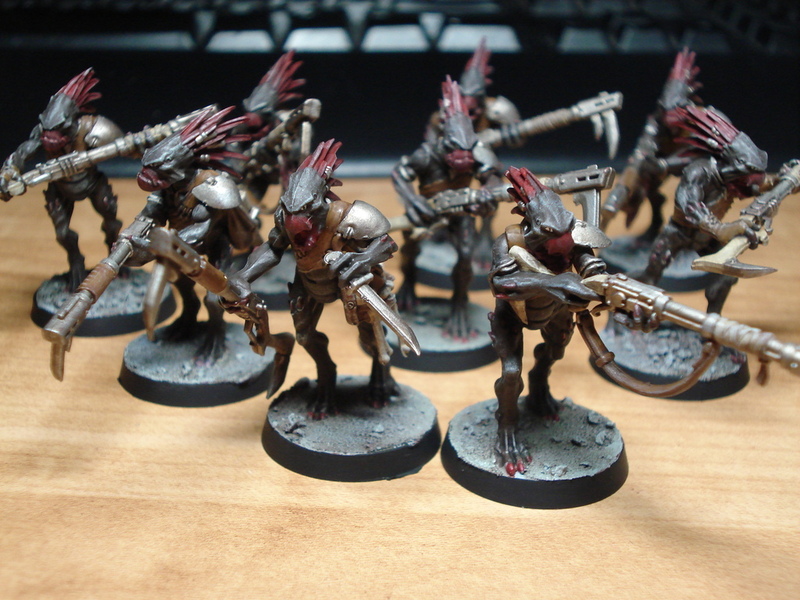 I ended up doing the light brown with the crest of red that will match the Kroot themselves. 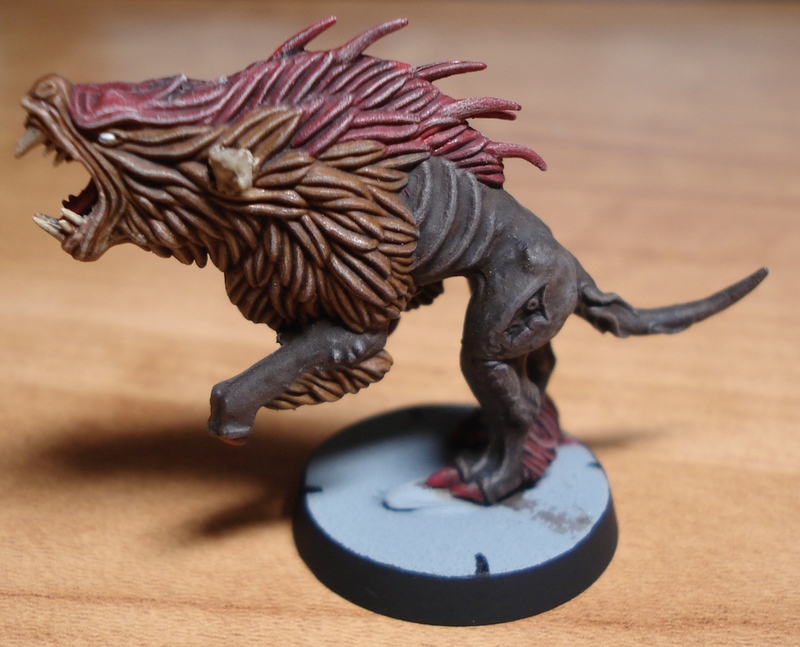 This hound still needs to be highlighted, and of course the basing. The colors on the Piranhas have been blocked out and the base coat has been applied. 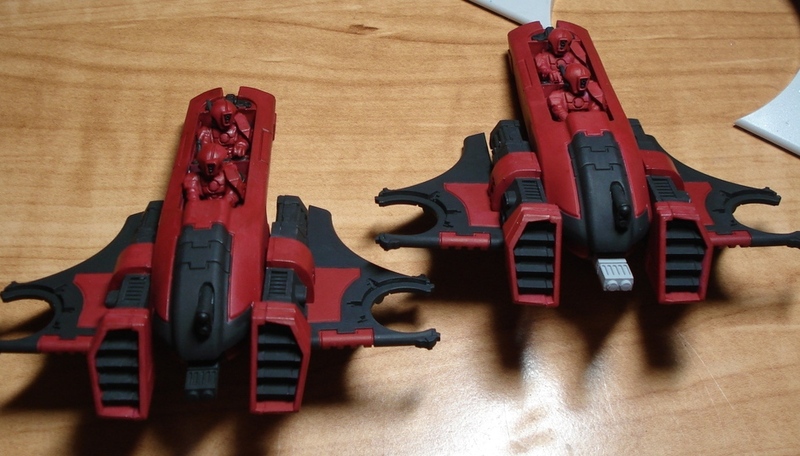 They need the detailing picked out and some highlighting and shading. I’m really pleased with the overall colors and I plan on using a similar scheme now on the larger tanks. 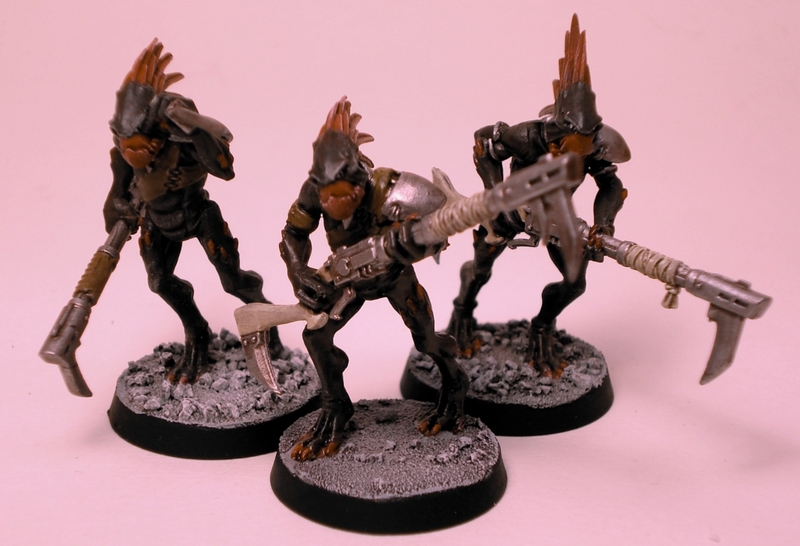 The first full squad of Kroot is now finished for my Tau army. I really like the way these guys turned out. Very savage, but at the same time they will fit in well with my overall color theme. I’ve been meaning to post these pictures for a while now, but here they are. 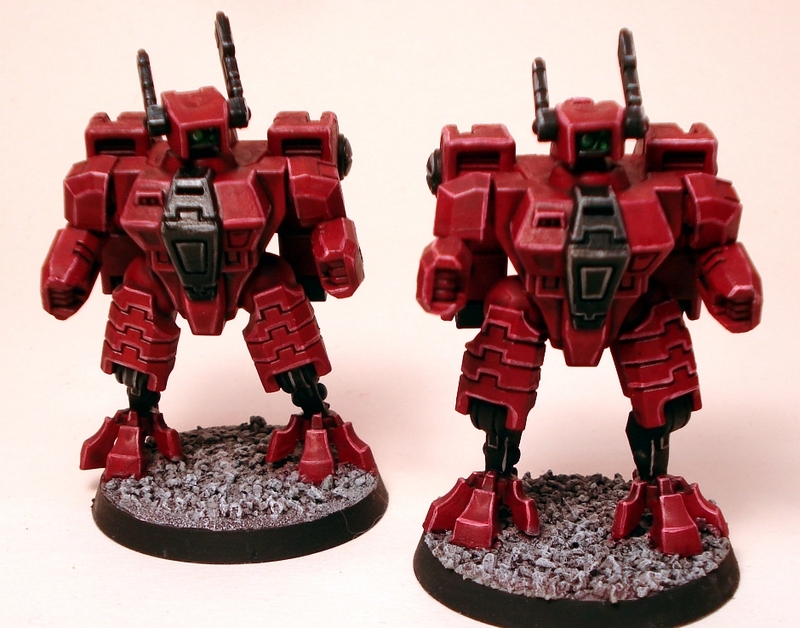 These are the first few finished models from my Tau army. 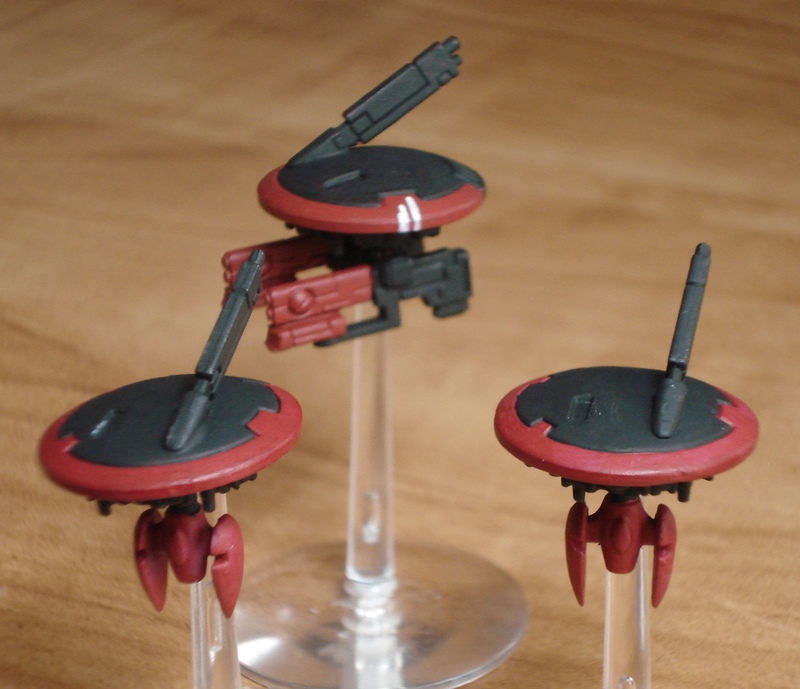 The Crisis suits still need weapons, but in general they are complete and I think they turned out really well. The pictures are a little weird because the red color plus the warm light from bulbs I was using cause them to be a bit overly red, so I tried to tone them down a bit with GIMP.